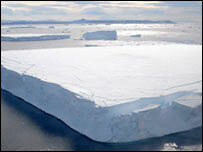 There is a net loss of ice to the ocean from the Greenland and Antarctic ice sheets, a study has found. In one of the most comprehensive studies of its type, satellite data was used to plot changes in the height of the ice sheets between 1992 and 2002. 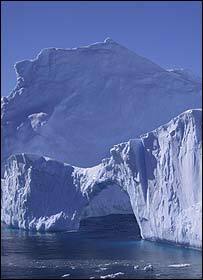 Writing in the Journal of Glaciology, a US team says that 20 billion tonnes of water are added to oceans each year. Mass changes in the ice sheets match predictions from computer models of global climate change, they say. Dr H Jay Zwally, of the US space agency (Nasa) Goddard Flight Center in Maryland, and colleagues analysed radar altimeter data from two European remote-sensing satellites, ERS-1 and ERS-2, as well as Nasa's plane-based Airborne Topographic Mapper instrument. The survey documents extensive thinning of the West Antarctic ice shelves, but a thickening in the East of the continent, though not by as much as some other studies have shown. It shows the interior of Greenland is gaining mass due to increased snowfall, but the edges are getting thinner. This mass gain is something which computer models of climate have predicted. Warmer air is able to carry more water; so as the atmosphere heats up, Greenland and Antarctica should experience greater snowfall. But rising temperatures could have the opposite effect at the edges of both landmasses, causing rates of melting to increase. A recent study led by Eric Rignot of Nasa's Jet Propulsion Laboratory showed the amount of ice dumped into the Atlantic Ocean by Greenland's glaciers has doubled in the last five years. "A race is going on in Greenland between these competing forces of snow build-up in the interior and ice loss on the edges," explained Dr Zwally. "But we don't know how long they will be approximately in balance with each other, or if that balance has already tipped in favour of the recently accelerating outflow from glaciers." The Rignot study included data up to 2005, whereas Jay Zwally's analysis ran only until 2002. In the Antarctic, the new findings confirm the trend of other recent studies - that the West is losing mass to the oceans whereas the ice sheet in the East is either getting thicker or remaining stable. "This seems to suggest that East Antarctica might not save our bacon after all," commented Dr Liz Morris of the Scott Polar Institute in Cambridge, UK. "We knew that West Antarctica was losing ice rapidly," she told the BBC News website. "The surprise is that the East Antarctic isn't showing more of a gain. "Maybe the story there is that the moisture is never being carried on to the continent. You have got to get that packet of warmer air to the ice sheet in the first place." If ice is on balance being lost to the oceans, it could be contributing to global sea-level rise; and according to Jay Zwally's research, it is, but by less than expected. "The study indicates that the contribution of the ice sheets to sea-level rise during the decade studied was much smaller than expected, just two percent of the recent increase of nearly three millimeters a year," he said. "Current estimates of the other major sources of sea-level rise - expansion of the ocean by warming temperatures and runoff from low-latitude glaciers - do not make up the difference, so we have a mystery on our hands as to where the water is coming from."